Remove the swearing, the blood, the Eminem songs and the people of color from “Southpaw,” and you basically have the most popular boxing movie of 1935. Director Antoine Fuqua and screenwriter Kurt Sutter (“Sons of Anarchy”) employ just about every old-school trick in the book, down to the scene where a tearful father and daughter are forcibly separated in family court. If you told me an earlier draft of the script portrayed pugilist hero Billy Hope as a gifted violinist who puts down the fiddle and steps into the ring to pay for an operation for his blind kid sister, I wouldn’t be surprised. Still, clichés can be as fun in a new movie as in an old one, and if you come to terms with the fact that “Southpaw” doesn’t bring any ideas to the canvas that are any newer than Wallace Beery, this is an energetic enough fight picture to capture the imagination. It exists mainly to show off Jake Gyllenhaal‘s willingness to cover his ripped, weight-trained body with scars and tattoos to prove he’s a serious actor. Here’s the thing, though: He shouldn’t have to. Anyone who’s been paying attention to the actor’s work for the last decade or so has witnessed an extraordinary variety of complex, empathetic performances in films like “Enemy,” “Brokeback Mountain,” “Zodiac,” “End of Watch,” “Source Code,” “Prisoners,” and last year’s creepy, riveting “Nightcrawler.” Like so many attractive peers of both sexes, however, Gyllenhaal knows that the only way he gets to be a player in awards season is by obscuring his good looks and mortifying the flesh. Someday, an underwear model will cop an Oscar for performing Hamlet while covered in horse dung and carrying an anvil. Billy Hope makes a fine addition to Gyllenhaal’s gallery, but it’s only in the externals that the work is leaps and bounds beyond his best recent turns. 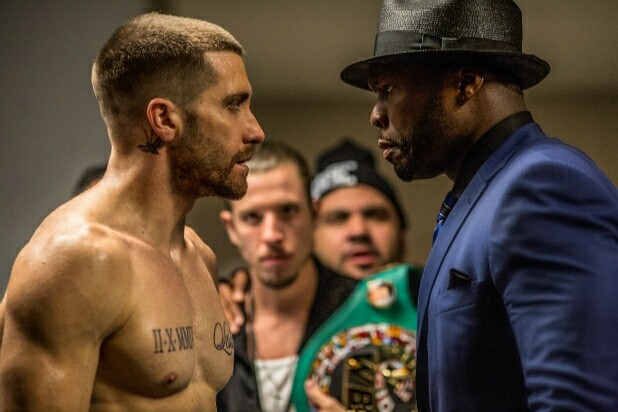 Where Gyllenhaal’s — as well as Fuqua’s and Sutter’s — abilities stand out is in demonstrating to us how Billy changes as a boxer over the course of the film; the fighter we meet at the beginning is not the one we see at the end, and “Southpaw” takes us through that process and lets even those of us unstudied in the Sweet Science take in Billy’s evolution. When the film opens, Billy is riding high with a champion belt. 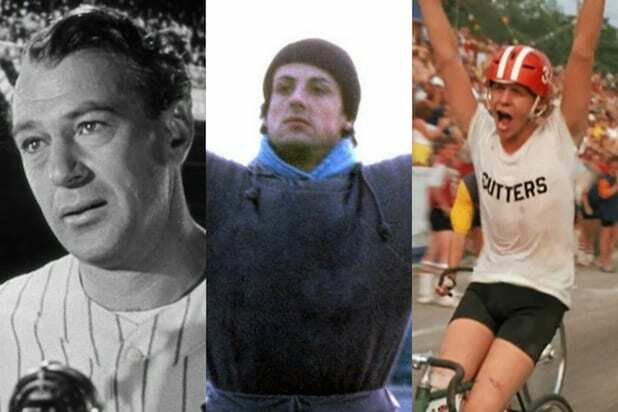 He’s risen from tough circumstances — sportscasters of the opening brawl mention twice that Billy and his wife Maureen (Rachel McAdams) were raised in Hell’s Kitchen orphanages — and now he’s living the good life. Tragedy strikes, and Billy falls apart physically and emotionally, and he loses everything, from the house and the cars to custody of his adorable, bespectacled daughter, Leila (Oona Laurence). Will a humbled Billy start again from the bottom, work hard under the unforgiving tutelage of his trainer, Tick (Forest Whitaker), and eventually get the chance to regain the belt by going the distance in a grudge match against a rival boxer now handled by Billy’s corrupt former manager Jordan (Curtis “50 Cent” Jackson)? You bet your sweet training montage he will. Fuqua and cinematographer Mauro Fiore (“Avatar”) don’t even attempt to get in the ring with “Rocky,” much less “Raging Bull,” so the matches are shot journalistically, in the bright, flat lighting familiar to anyone who’s ever watched a bout on HBO. It’s editor John Refoua (“The Equalizer”) who shines here, keeping the boxing sequences taut and suspenseful as the camera catches every drop of Billy’s literal sweat and blood. Gyllenhaal, McAdams and Laurence create a believable family dynamic, and Whitaker can’t help but be powerful in a role that has to be as automatic as shoelace-tying for the veteran actor by this point. Jackson radiates untrustworthiness, but unfortunately he does so from the moment he walks on screen, which is way before his cue, and it’s too bad that the talented Naomie Harris (“Skyfall”) doesn’t get more to do as Leila’s social worker. “Southpaw” is so simultaneously entertaining and unsurprising that it could go straight to ESPN Classic, but if these are the extremes it takes for certain people to notice that, hey, that guy from “Bubble Boy” has turned into a heck of an actor, then so be it.